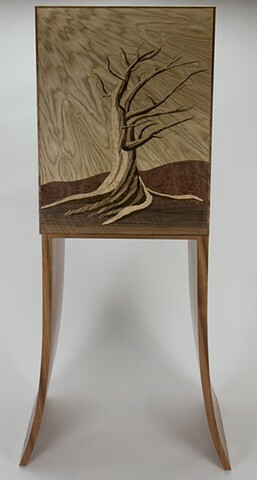 H 66" W 27" D 13.25"
This cabinet features a door covered with marquetry depicting a bristlecone pine, the oldest species of all living organisms. The cabinet is made with sapele hardwood and sits upon a sapele base made with bent, tapered, laminated legs. Three glass shelves in the cabinet may be adjusted to different heights.